Copyright: © 2018 Khmelnik SI. This is an open-access article distributed under the terms of the Creative Commons Attribution License, which permits unrestricted use, distribution, and reproduction in any medium, provided the original author and source are credited. The shortcomings of the well-known solution of the Maxwell equations for a spherical wave are indicated. A new strict solution of these equations is proposed. This solution, when applied in antenna design systems, should allow more formalization of the antenna design process and should improve the quality of the antennas. Antenna design, Maxwell’s equation, Spherical coordinates. The known solution does not satisfy Maxwell’s system of equations (a solution that satisfies a single equation of the system can not be considered a solution of the system of equations). In Figure 1  the picture of the lines of force of the electric field, constructed on the basis of the known solution is shown. Obviously, such a picture can not exist in a spherical wave. The picture of the lines of force of the electric field, constructed on the basis of the known solution. Figure 1: The picture of the lines of force of the electric field, constructed on the basis of the known solution. in the Maxwell equations system, in the known solution, only one equation of eight is satisfied, that is, the known solution does not satisfy Maxwell’s system of equations. These shortcomings are a consequence of the fact that until now Maxwell’s equations for spherical coordinates could not be solved. A well-known solution is obtained after dividing the entire domain into so-called near, middle and far zones and after applying a variety of assumptions, different for each of these zones. In practice, specified drawbacks of the known solution mean that they (mathematical solutions) do not strictly describe the real characteristics of technical devices. A more rigorous solution, obtained in , when applied in the design systems of such devices, must certainly improve their quality. This solution is briefly described below. 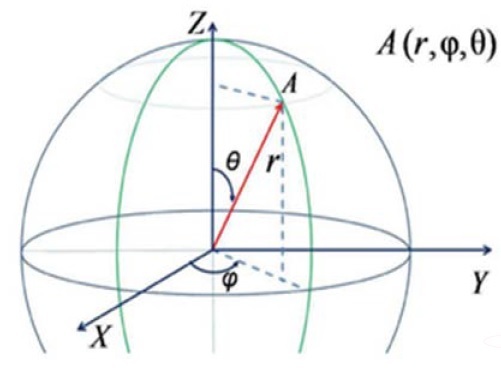 In Figure 2, the system of spherical coordinates ( ρ,θ,ϕ ) are shown. The system of spherical coordinates (ρ ,θ ,ϕ ). Figure 2: The system of spherical coordinates (ρ ,θ ,ϕ ). ε is absolute dielectric constant. With these designations taken into account, the formulas in Table 1 take the form given in Table 1. In the Table 2 we write the Maxwell equations. Table 1: Lists the expressions for the rotor and the divergence of the vector E.
Thus, there are eight Maxwell equations with six unknowns. This system is overdetermined. We have to admit that in a spherical wave there are radial intensities. However, even so, the system of Maxwell’s equations remains redefined. Let us also assume that there are radial electric currents of displacement. This assumption does not remove the problem of over determination, but adds one more problem. The point is that the sphere has an ideal symmetry and the solution must obviously be symmetrical. 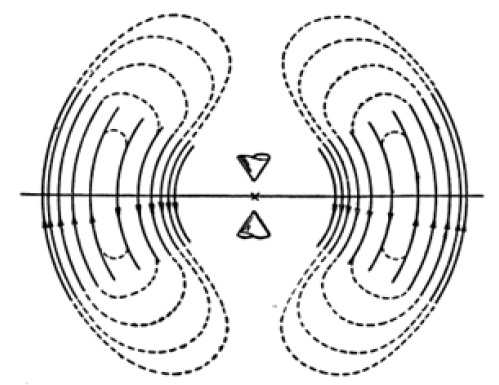 It is suggested that there are also radial magnetic displacement currents. Such an assumption does not require the existence of magnetic monopoles as well; the existence of electric displacement currents does not follow from the existence of electric charges. Next, we will look for the solution in the form of the functions E, H, J, M, presented in Table 3 (Eq. 2), where the actual functions of the form g( θ ) and e( ρ ), h( ρ ), j( ρ ), m( ρ ) are to be calculated, and the coefficients ∝, ω are known. Table 3: Solution in the form of the functions E.
Table 4: Maxwell equations in spherical coordinates. After this, the functions j ρ ( ρ ) , J ¯ ρ ( ρ ) , m ρ ( ρ ) , m ¯ ρ ( ρ ) can be found using the equations in Table 4 (Eq. 2.1 and 2.5). Here G is a constant that can take different values for the functions e ρ and h ρ , D is a constant that can take different values for the functions e ¯ ρ and h ¯ ρ .
Maxwell equations in spherical coordinates and the main properties. Figure 3: Maxwell equations in spherical coordinates and the main properties. There are electric and magnetic intensities along all coordinate axes. The electric and magnetic intensities of the same name (according to coordinates ρ , ϕ , θ ) are phase shifted by a quarter of a period. The amplitudes of the transverse wave intensities are proportional to ρ −1 . 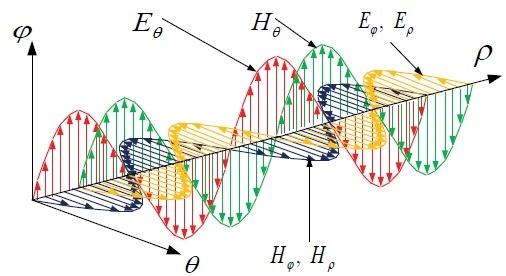 There is a longitudinal electromagnetic wave having electric and magnetic components, i.e. there are radial electric and magnetic intensities. The energy flux directed along the radius retains its value with increasing radius and does not depend on time, which corresponds to the law of conservation of energy. There are radial electric and magnetic displacement currents. should improve the quality of antennas. Therefore, based on the solution found, it is advisable to begin developing a new system for the automated design of antennas. On the basis of this same theory, the problem of detecting the position of the radiation source by measuring the intensities of the electromagnetic field in a limited region of the radar can be solved.